I was unsure what to expect when I registered for a two-unit Environmental Studies course on Catalina Island. I asked myself, would there be a lot of hard science involved? If there’s anything I’ve learned in my academic experience thus far it is that hard science and I haven’t the best of relationships. Give me books and complex ideas about the world and I’ll provide you a philosophical treatise; put me in a lab and my face will be reminiscent to that of a child lost in Disneyland. However, I could not pass up the opportunity to learn about a subject as critical as sustainable food production in a place as beautiful as Catalina Island. Spring Break Catalina was a go, and what an experience it was. We departed San Pedro with a small class totaling four students, which gave the class an intimate group discussion dynamic throughout the course as well as the freedom to explore the Wrigley Institute’s surrounding areas. The small group setting allowed for open conversation about the day’s topic and gave everyone ample opportunity to participate, a privilege which is often limited in typical classroom settings. The close proximity of everything on the campus, from dorms to classrooms to set meal times, allowed us to get to know each other as well as other students visiting the campus for various reasons. As a result of these circumstances coupled with the beautiful setting, the learning environment for such a course couldn’t have been better. Which brings me to the course material itself, the actual “work” that had to be accomplished in this short week away from home. It was fascinating to learn about aquaponics and have the opportunity to get hands on experience with Wrigley’s aquaponics system in order to thoroughly explore how everything works. The idea that plants can grow without soil, roots hanging in water, still seems slightly hard to believe. On top of understanding how the system operates (even getting to build a simulated system ourselves), I found learning the chemistry, both in lecture and in lab, to be more interesting than I can remember in my other experiences with hard science. I suppose the reason for that is because I know that the work I am doing is being directly applied to this functioning aquaponics system a few feet away, and that the work is contributing to some body of research which is important for the further development of this unique method of food production. Beyond the aquaponics system itself, the course also investigated food issues more broadly in their relationship to social science discourses such as environmentalism, economics, international relations, sociology, and so on. Given that I am an international relations major, I enjoyed contributing to the course through my expertise on matters related to social science, an area that other students were less familiar with. I took advantage of the case study I was assigned to examine issues of food sovereignty and food security, which are increasingly important matters in a world of large-scale agribusiness and a globalized marketplace. Other students used their interests, from business to environmental engineering to biophysics and game design, to inform their case study in an overall wide-ranging discussion of all things food-related. Furthermore, the opportunity to speak with the director of Community Services Unlimited, Neelam Sharma, about the work her organization is doing to provide access to nutritional food in poor, South Los Angeles communities was both insightful and inspiring. Overall, the learning experience was vast, covering numerous aspects of the multifaceted subject of sustainable food production, and I was appreciative of that. But work cannot take place all day and night, or at least it shouldn’t. We took full advantage of our beautiful Catalina Island setting to play in the water and on the trails. By that I mean kayaking, snorkeling, and hiking, pretty much every day. 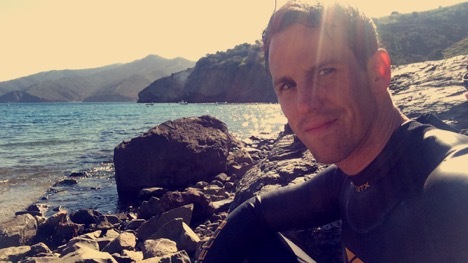 Considering that I was also in the middle of triathlon training, I was also had the opportunity to do longer swims out to Two Harbors in those crystal clear waters and run for miles on trails that overlook huge portions of the island and the deep blues of the vast Pacific Ocean. Given all of these experiences, from a fascinating education, great instructor, small group dynamics, and exploring the natural beauty that surrounded us, I’d say this two-unit Environmental Studies course was a rather great decision. This entry was posted in Undergraduate, Wrigley Institute on April 27, 2016 by Jessica Dutton. What do six students, one dog, a bison named Bill, and five professors all have in common? 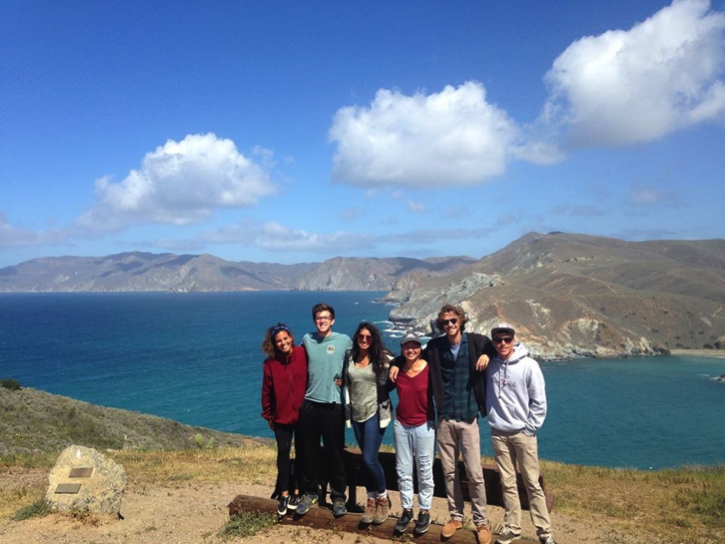 That’s right- they’re all participating in the USC Environmental Studies Program‘s “study abroad” semester at the USC Wrigley Marine Science Center on Santa Catalina Island- aka the most outdoors, star-filled, hands-on experience-based learning you can get from USC (or anywhere frankly). I was fortunate to be one of the six students and have loved every minute of my time on the island. Our classes are structured in a block schedule, meaning we take one class for about three and a half weeks and then switch to an entirely new class. Being able to focus on one subject at a time allows for a greater understanding and more in depth look at the material, which is awesome when what you learned that morning in lecture is directly applicable to the field work you do that afternoon. The six Cat semester students in front of Shark and Little Harbor on our trip to Avalon for the day. During the three and a half weeks of class, the professor comes out and lives with us on the island. What’s really cool about essentially living with your professor is that you get to known them well outside of the classroom setting. Some nights after dinner we would sit for an hour talking about the latest episode of “Making a Murderer” or discussing various internship/summer opportunities or what classes you should take for specific graduate school programs. I now have five different professors who I feel would be willing to write me a letter of recommendation or help me in general going forward. As a current freshman, it’s nice to know that I already have these kind of connections and mentors in my life. Also, “office hours” are literally whenever they are awake to meet with you, which is super convenient. 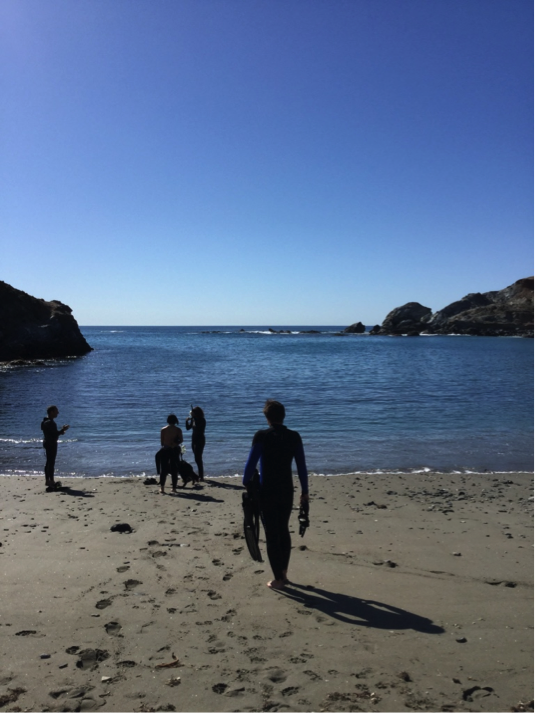 Class one day: snorkeling and looking at eelgrass densities in Little Harbor. While we do spend a fair amount of time in “class,” with lectures in the morning and field work or labs in the afternoon, we have ample free time. Some of this time we fill with kayaking, snorkeling, fishing, hiking, exploring caves, visiting Two Harbors & Avalon, sleeping, watching Netflix, putting together puzzles- basically whatever we can think of that sounds fun. Oh and doing our homework of course. One of my favorite aspects of living on an island is just how in touch and integrated you are with the environment. I see foxes, birds, squirrels, and bison on an almost daily basis. Even the plant life is beautiful, albeit painful- especially when you run into a prickly pear cactus which seem to be everywhere. Living on the island is exciting in itself, but sometimes you just want to interact with different people, which is why this program is perfect, because LA is only an hour and a half boat ride away. We have students who go back every weekend and we have students who have only been back to the mainland twice in four months. Overall, I’ve had one of the best semesters of my life in terms of getting a great hands-on education, experiencing the natural beauty of Catalina, and living on an island for crying out loud. I feel so blessed to have this opportunity and encourage anyone even remotely interested to seriously consider the program! Even if it’s just for a weekend or a day, Catalina Island has a lot to offer and is worth seeing once in your life- I know I am going to miss it come May. 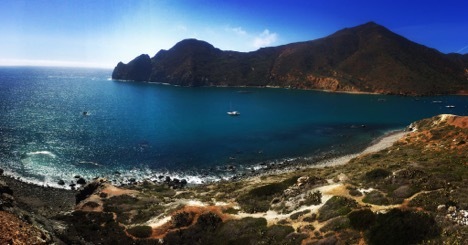 The natural beauty of Catalina is stunning! One of our almost daily views. Autumn is a freshman in the USC Environmental Studies Program, class of 2019. This entry was posted in Undergraduate, Wrigley Institute on April 11, 2016 by Jessica Dutton.